Sources with connections to the Wheaton City Council claim that the council rejected a "Religious Freedom" Ordinance. 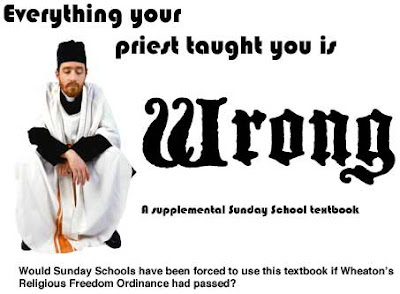 Had it passed, it would have protected Sunday School teachers and other religious teachers who wanted to teach "different viewpoints" in their classes. The councilor who proposed the ordinance said he was inspired by the story of a Hebrew School teacher in the Chicago area who converted to Christianity. When she tried to proselytize to her synagogue's pre-school class, she was promptly fired. "The woman was oppressed for teaching children about her new found love for Jesus Christ!" The councilor is alleged to have said. "That poor woman is now looking for a job in this economy! Let's make sure this never happens to a Wheaton resident!" The ordinance was debated in closed session, the sources said. While the other members were sympathetic to her plight, they did find a serious flaw with the ordinance. "The council realized that the ordinance could be used to protect non-Christians." Said one of the sources. "A teacher could make a Sunday School class read Sam Harris's books, and she would be protected under this ordinance. Or a Muslim could ask for a job at a church, and they would be forced to hire him!" The City Attorney rejected other alternatives, like only protecting Christians, because he felt they were unconstitutional. The councilors decided not to mention the ordinance at their next public meeting, according to the sources. Instead, they will work on a resolution praising Wheaton's religious heritage. None of the Rabbis that The Babbler spoke to claimed to have fired a teacher for preaching Christianity. Don Harkin of the Aurora chapter of American Atheists, expressed disappointment that the ordinance didn't pass. "Christians have been trying to get their views taught in public schools for years. It would have been nice to get our views taught in their churches for a change. We even had a textbook ready just in case." When asked for comment, a spokesperson for Mayor Michael Gresk said, "you guys have active imaginations. I'm sure the mayor will pray for your souls too. Oh, and Jesus loves you." Illinois resident space aliens protest extra Metra fees. Talking Minnesota Land Squids invade Bolingbrook! Super Bowl XLIII tainted by alien cheating?